The only Virtualization Platform dedicated to Hosting Telephony & Unified Communications in the Cloud. It delivers a wide range of IP services and applications with 99.999% availability, stability & reliability for a maximum up-time. 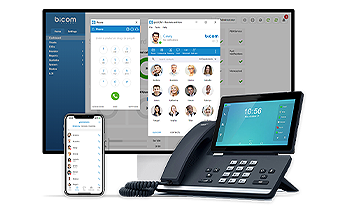 Serve many different types of clients with different PBXware editions at the same time as well as TELCOware, sipPROT and sipMON all through one SERVERware interface. 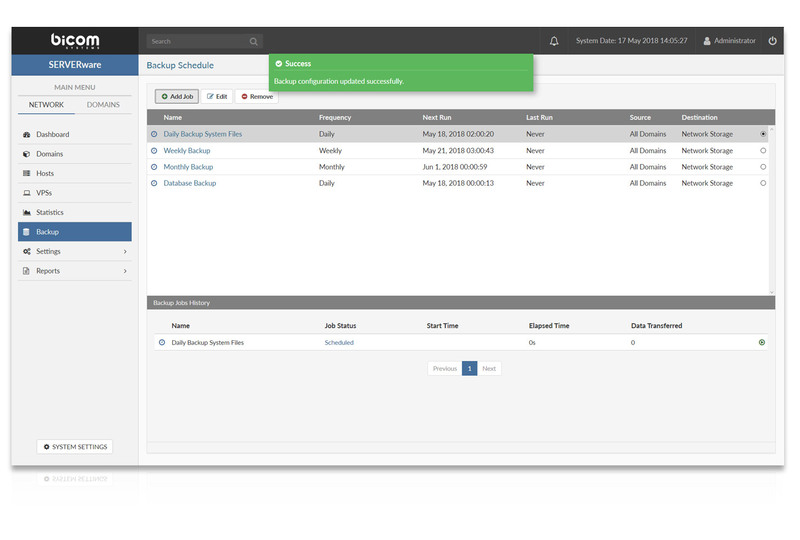 The new GUI has made Management of Hosts, VPSs & Resources easier than ever. 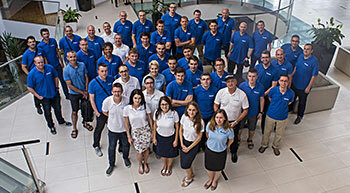 SERVERware 3 has been completely revamped with the new underlying virtualization technology, 64bit and 32bit backward compatibility with the older versions of PBXware, shared, fault-tolerant, highly available and redundant network storage, high data integrity protection and built-in backup system. Bicom Systems’ SERVERware Virtualization Platform is available in the Standalone, Mirror and Cluster Editions, offering Fault Tolerance, High Availabillity as well as Processing and Storage Scalability. Easily deploy Virtual Private Servers (VPSs) with the allocated resource pool (Processing, Memory, Storage, and Broadband). SERVERware Virtualization Platform will automatically create a Highly Available setup for you (a duplicate instance of VPS) by simply selecting the option during the configuration. The entire process is completed via a few simple clicks only. The VPS Commands that are available at a click of a mouse are: Start, Stop, Freeze, Copy, Move and Restore. These functions allow System Administrators to manage more from the GUI and less from the CLI. With SERVERware System Administrators can manage users, domains, IP pools, service pools, sipPROT… all from one interface with the added benefit of using Domains to enable easier resource management and isolation. A Domain can represent a company, department or an individual each having its own resources and its own Domain Members. Domain Members are divided into Domain Administrator, VPS Administrator and VPS Owners each assigned with different permission levels allowing resource management and monitoring. SERVERware 3 Virtualization Platform allows you to allocate and extend IP pool in a LAN subnet and then split them per Domain. You can also define service pools and then assign processing hosts to these pools. Monitor your system resources and status of all Hosts and VPSs by using the SERVERware Dashboard. All relevant system information (CPU, Memory & Storage) is contained within a single screen and delivered comprehensively in real time. 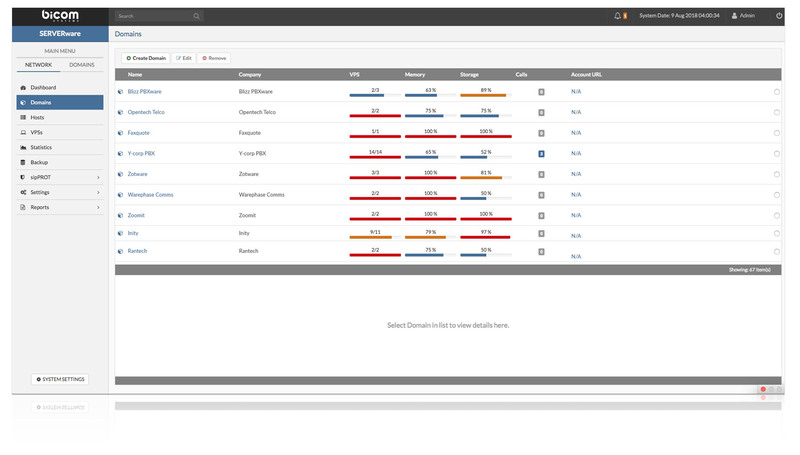 Recently triggered alarms are displayed on the dashboard allowing everything to be in one centralized screen. SERVERware allows administrators to create Domains and assign them to a company department or third party. Domains are basically containers with assigned resource pools, allowing a Domain Administrator to deploy and manage VPS. This allows System Administrators to allocate each domain their resources (RAM & Storage). 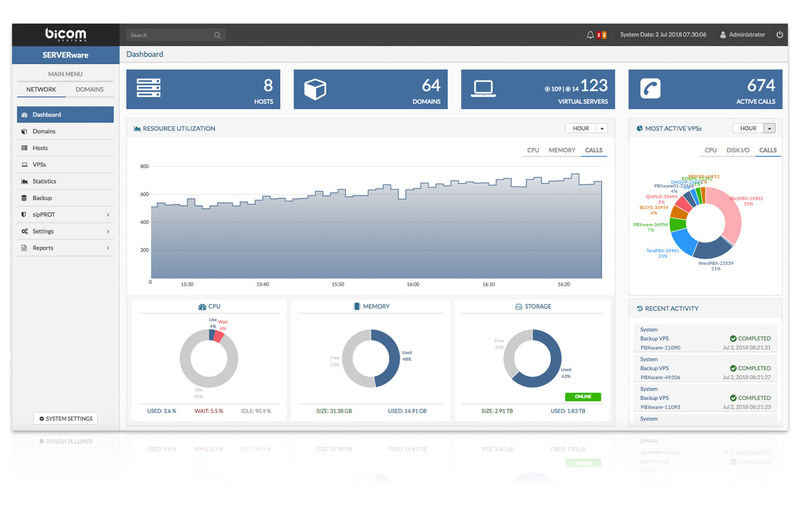 You can now monitor network resources, hosts, and servers with ease. SERVERware system monitoring module actively searches for errors and reports them back to the administrator via notifications and alarms, while SERVERware statistics module collects data about system usage and displays them inside a graphic user interface. The new and improved GUI allows a user to quickly clone, create and move VPSs, thereby simplifying the installation and setup process. 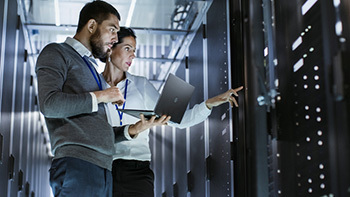 SERVERware’s built-in backup functionality provides an easy way to additionally protect hosted services, allowing you to schedule a full/incremental backup at a desired time with the possibility to select target destination. Backups can be configured for ALL VPSs in the Virtualization Platform or per domain. SERVERware Virtualization Platform offers two levels of access: System Administrators & Domain Member. System Administrators have Full Privileges while Domain Members have Privileges limited to their Domain. Within the Domain members group, you will find Domain Administrators, VPS administrator and VPS Owner each with different permission level based on their needs. 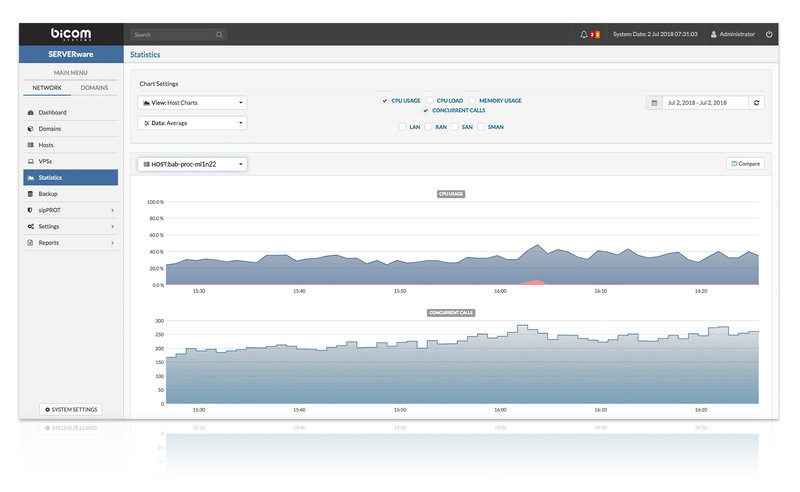 The SERVERware statistics module collects data in regards to the resource usage per Host and VPS. Data on a wide range of metrics is collected frequently. The gathered data is processed and archived in the database to be displayed on the Serverware GUI. The performance charts graphically display CPU, memory, network, concurrent calls metrics, Hosts and VPSs that are managed by SERVERware Virtualization Platform. Knowing when something is about to go wrong is the best tool for network admins. SERVERware monitors the status of main system components (both virtual and physical) resources. If system resources reach the threshold or should Hosts/VPS go down SERVERware will failover and send a notification to the administrator in real time, indicating the issue. 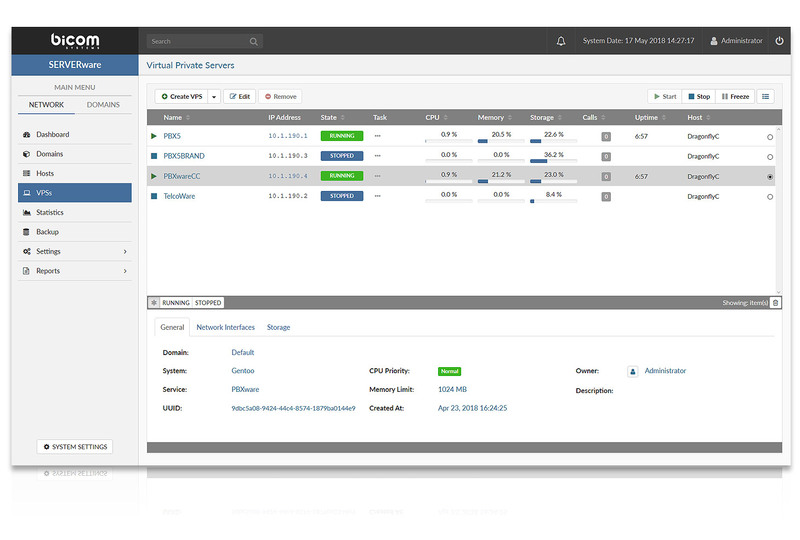 With SERVERware Virtualization Platform you can deploy a new PBXware instance with a single click. Serve many different types of clients with different PBX editions at same time all through one interface without the need for extra hardware. Start your Telco with a single industrial grade server and SERVERware Standalone edition. Start your Telco the right way with added stability and redundancy on two industrial-grade servers and SERVERware Mirror edition. Easily expand your startup or switch an already established Telco business to the most flexible Telephony Serving platform on the market.